The Paddlesports Safety Facilitator course is geared to certify livery staff, parks and rec staff, and other entities that rent gear to the public. The course focuses on safe boating principles, land based rescue, and helping those who have capsized get back on their way. Combined with an assessment in either Canoe, Kayak, or Stand Up Paddleboards, this course would be appropriate for those taking others out on the water in order to be safer, more preventative, and competent in maneuvering and rescues. The 1 day course includes the Paddlesports Safety Facilitator Certification and an assessment in 1 craft (Canoe, OR Kayak, OR Stand Up Paddleboard). The price also includes a 1 year membership in the American Canoe Association, a Paddle Sports Safety Facilitator certification, and an assessment certification for those passing the assessment. Cost for the 1 day course is: $80/person (current ACA Members receive a discount of $25). You can stay an extra day to add an additional craft (or 2) assessment to your certification. Each additional craft added is $25 (+day 1 fee). 1 craft only from 8:30-12:30; 2 crafts 8:30 – 5:00. ​This course is appropriate for: Camps & Conference Centers offering programs on lakes or rivers; County & City Parks and Recreation Canoe Program Staff or Trip Leaders; Physical Education Programs wishing to teach paddling as a life-time sport; Current Certified Instructors needing updates; Anyone wishing to gain in their own skills as well; and Girl Scouts and Boy Scouts leaders wishing to lead trips for Scouting programs. COURSE PRICE: 1 day with 1 craft is $80. Day 2 with 1 additional craft adds $25. Day 2 with 2 additional crafts adds $50. A $55 non-refundable deposit (due by May 24) counts toward your total fee, and all balances are due before May 29. Cost includes all instruction, materials, and 1 year membership in the ACA. Current ACA Members receive $25 off their course price. LOCATION: Buchanan, VA (James River) area; meeting location TBD at the river will be sent with course information. EQUIPMENT: Participants may bring their own boats, paddles and lifejackets, OR may rent gear for an additional fee for the duration of the course: $15 for canoe gear and $20 for kayak gear or SUP gear. Indicate equipment needs in your Registration Form below. INSTRUCTOR: Beth Wiegandt is a Canoe and Kayak Instructor-Trainer with the ACA, Chair of the ACA Introduction to Paddling Committee, and ACA Instructor for SUP and River Safety and Rescue. She's been instructing paddlers and leading area trips since 1989. Contact Beth at YourOutdoorClassroom@gmail.com. LODGING: Camping is separate from your course fees. 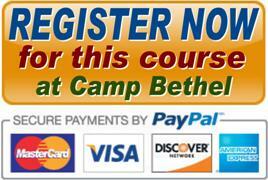 At Camp Bethel, you may tent camp for $10 per tent per night. Indicate camping needs on your registration form, OR choose from local hotels. REGISTER BEFORE MAY 24: A minimum of 5 participants and maximum of 12 ensure that you receive the individual attention you need to succeed in this course. Register on line below. A $40 non-refundable deposit counts toward your total fee, and all balances are due before May 29. ​1. Make your deposit payment below through our secure "Register Now" PayPal button using any major credit card or a PayPal account. You must pay your deposit to register on-line, and all additional fees will be billed to you separately by e-mail in a few days. There are no additional fees or surcharges for on-line registration, and you will be able to review your fee prior to payment. 2. Submit Data: After successfully paying your deposit, PayPal will direct your browser to our secure ACA Course Registration Form. Allow at least 10 minutes to complete, and be as thorough as possible before you SUBMIT the form. 3. Get your Confirmation E-mail: After submitting your Registration Form, instructor Beth Wiegandt will contact you via e-mail. Add "YourOutdoorClassroom@gmail.com" to your contacts so that Beth can send you an e-mail with links to your course information, a required Health Form, any additional payments due, and important information about your course. Number of days attending; fees billed to you later. $0 additional: 1st day and 1 craft. $25 additional = 2nd day and 1 additional craft. $50 additional = 2nd day and 2 additional crafts. $0 no camping needed. $10 per tent per night, to be billed later. $0 no rental gear needed. $15 to rent canoe gear. $20 to rent kayak gear. $20 to rent SUP gear. Will need to rent multiple crafts (Beth will contact you).